WebmasterQuest traffic exchange is easy and fun, and allows you to quickly and easily earn visitor credits, visitor credits can then be exchanged for visitors to your sites. 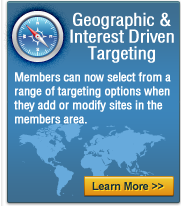 Members can select from a range of targeting options when they add or modify sites in the members area. Targeting allows us to instantly pick the best sites to show members while they surf, this means better quality visitors to your sites and a more enjoyable surfing experience. Instead of just picking a random site to show a visitor, we match sites to visitors. If you say "I only want to show my site to people from North America who are interested in 'Internet Promotion'" then we will do our very best to show your sites to visitors using those targeting options. You can rack up thousands of credits from other traffic exchanges, but are they looking out for you, are there even real people looking at your sites? WebmasterQuest provides the very best in Anti-Cheating Technology and techniques to stop emulators, auto-clickers and all other cheating software from working. 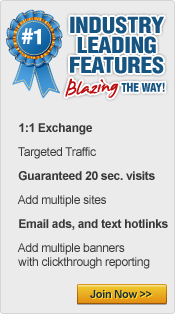 Time is money so make sure you choose traffic exchanges that protect you from the cheaters and assure that real people are looking at your sites. With Top Notch Technology and being 100% Free to join, you simply cant go wrong by becoming a WebmasterQuester Member and begin receiving quality targeted traffic in just minutes from now. Join Today and become part of something big.